This winter across the entire country has been a huge advertisement for Yaktrax, The product is a system of stretchy metal coils you attach to your shoes or boots so you can stay upright on snow and ice. I have had a pair for years, but of course, was not wearing them last year when I fell on black ice on my driveway. Smart, eh? But this year they are a constant accessory to my winter garb. My set of Yaktrax are permanently attached to an old pair of sneakers and are definitely my footwear of choice when I am walking to the mailbox or to sweep off our front steps. I have not experienced even a slip so far. Now, I haven't sought out huge patches of glazed ice to try them out on either, but I have seen such patches and stayed as far away from them as I can. There are different brands of these shoe add-ons and different styles. 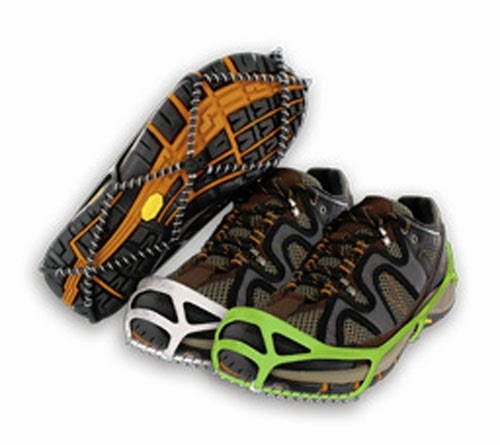 Yaktrax makes these items for walking, running and skiing. I have to admit I was very leery of this winter because of my fall last year, but these products have given me back some of my confidence to go out and tackle winter. Thank you, Yakrax.